Skeptics of China’s economic model have looked like hopeless gloomsters for years. Even though they are correct when they point out negatives, such as the fact that no large economy has ever had 50% of GDP coming from investments and exports for a sustained basis or has managed the transition from being export driven to consumption driven gracefully (the US’s and Japan’s deflations are prime examples) seemed irrelevant as China was able to maintain attractive growth rates in the wake of the financial crisis by providing massive stimulus (aka more investment). Even worrying signs, like the fact that it takes more and more debt to produce incremental growth (the ratio was worse for China in 2009 at 6:1 than the US on the eve of the crisis, at 4 or 5 to 1, and it’s deteriorated since then) and oft reported on spectacle of cities full of high end housing that sit vacant, haven’t dented the widespread faith in the ability of Chinese leaders to navigate, at worst, a soft landing if the world economy ratchets down into a lower level of growth thanks to austerity in Europe and the US. GMO, in a compelling analysis (hat tip MacroBusiness), not only confirms the skeptics’ case but provides reasons why the Chinese growth model faces an end game. While it may not be nigh, it seems to be closer than most people think. The growth of a shadow banking sector, which includes products that resemble structured investment vehicles and CDOs, which our crisis showed allowed speculators to take risks with far too little in the way of equity behind them. 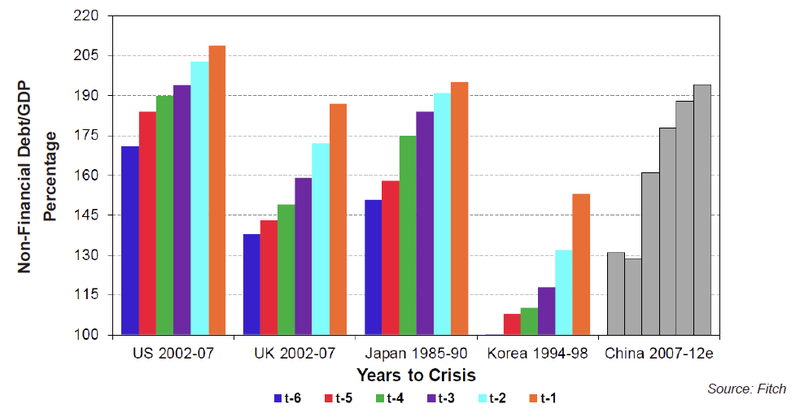 Possible self-imposed constraints on Chinese government spending if another financial crisis occurs. The Chinese government has reached a government debt to GDP ratio of 90%, which a widely cited study by Carmen Reinhart and Ken Rogoff found is correlated with lower growth. I’ve criticized this study, in that it mixes actual and de facto gold standard countries with fiat currency issuers, and also suggests causality (as in higher debt leads to lower growth) whereas in many cases, the cause is more plausibly that a financial crisis caused debt levels to blow out because tax revenues collapsed and impaired growth permanently. Nevertheless, if the Chinese think increasing debt levels further is a bad thing (as in they buy the Reinhart/Rogoff thesis), they might not respond as aggressively as the did in the wake of the global financial crisis. (Note this is my take on the GMO 90% government debt to GDP ratio; the report raises it as a concern in and of itself). Capital flight. Flagged by Victor Shih as a serious risk years ago; it’s finally happening. Read the report. It’s short and compelling. 2 Responses to "China Economic Paradigm Nearing End Game"
China is an oligarchic government which is nominally communist, if the bubble pops they can easily kick out and execute the troublemakers and redistribute the wealth, change the rules, and move on. They can all do this in months.